Have you been following along on our #CountdownToHalloween on Instagram? We are in the home stretch, and can hardly stand the excitement! We have another great event happening this weekend, but we wanted to show you a brand new costume first. Our Halloween stores across the country have new product arriving daily, and this is one of our new favourite costumes. Towering Terror Costumes, from California Costumes are the coolest costume for giving a good spook to your trick-o-treaters! 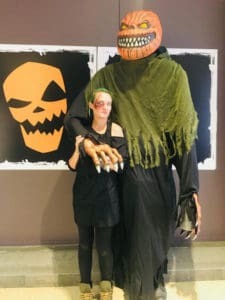 Some of our crew in Halloween Alley Edmonton West, busted this terrifyingly large pumpkin costume out and let him loose in West Edmonton Mall! Pumpkins not your style? We also have it in a Towering Vampire! Now that that’s out of the way, we should probably tell you about what the title of this blog says… We’re kicking off another in-store event with your chance to win a $100 Halloween Alley Gift Card. We want you (as always) to Celebrate Life. Halloween Style! Each Halloween store across Canada will have a different code to Text-to-Win a $100 Halloween Alley Gift Card. Make sure to visit a location near you, October 11th through 13th, for your chance to win this $100 gift card. The winners will be posted on October 15. Have an extra costume lying around? Bought a few to many goodies at last years It isn’t Over Yet sale? Join the ranks of our Donate a Costume program. Our Halloween Store in Saskatoon takes their new and gently used costumes to Care and Share Saskatoon, whose mission is to ensure all children have an opportunity to develop all of their potential: in sports, in school, in culture and in recreation. Our store in Kelowna donates theirs to the Kelowna Women’s Shelter.